With the cold weather here, I'm trying to make the house cozier. 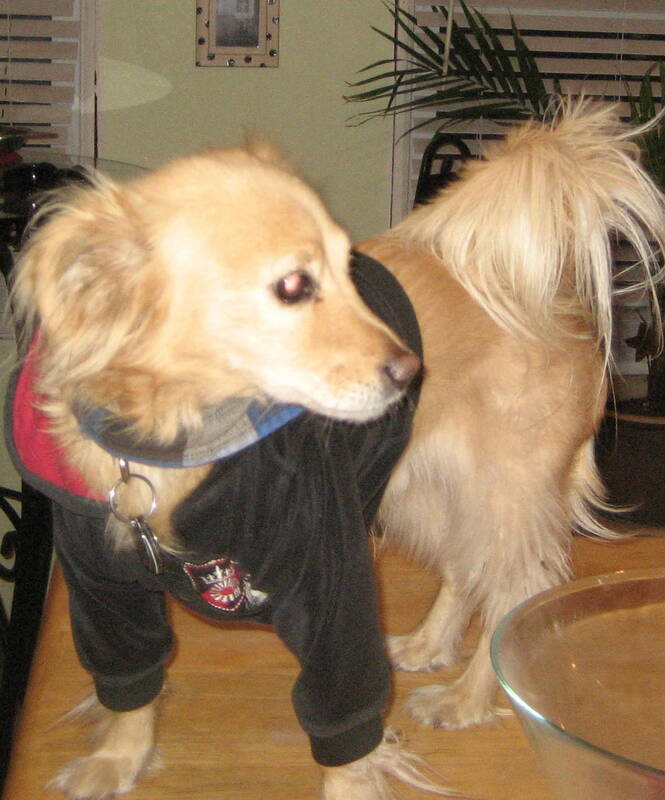 That includes making our dogs cozy too. We took their Hawaiian print collars off and now both dogs are sporting their flannel collars for the winter. 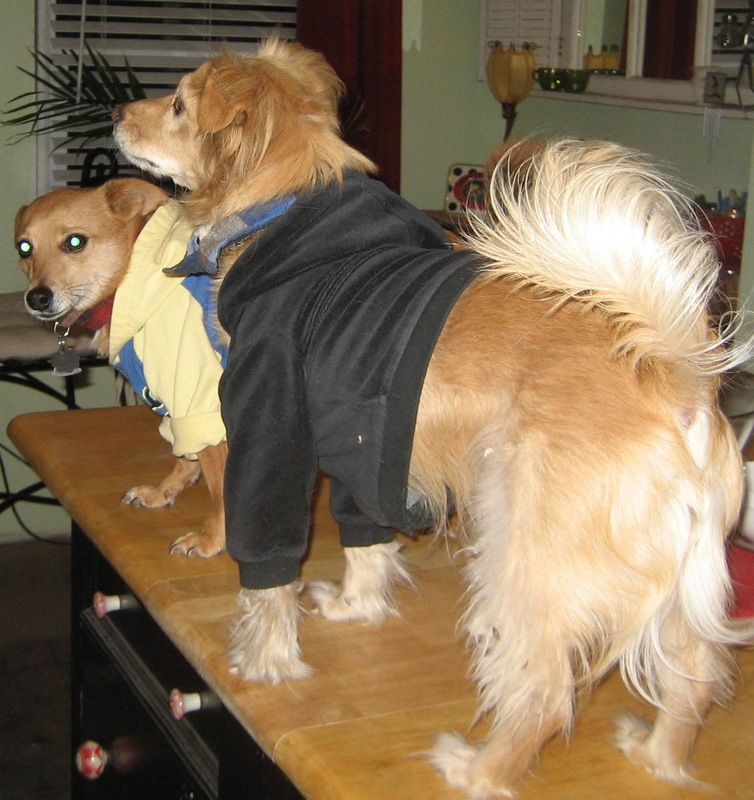 I also bought sweatshirts for both of them. 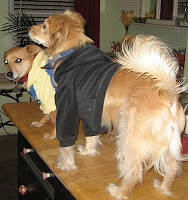 Both dogs are small, so I bought 0-3 month size hoodies at the thrift store to keep them warm. They look so cute! 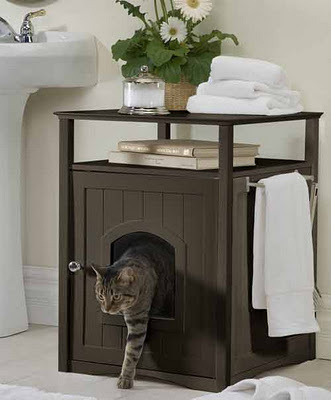 We don't have cats so we don't have to worry about this, but many of you have both so I thought I'd share this clever Pet Station created by Kristi at Addicted 2 Decorating. I really like the idea of having the cat food on the top so the dog(s) can't get it. But you could alter it to meet whatever needs you have. 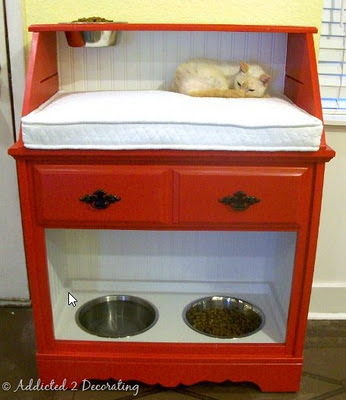 For example, the dogs food could go on the bottom, or you could put a second bed down there. Or even leave the doors on and store the extra pet food and supplies down there. If you have time, click on the photo and check out Kristi's blog, she has some really great ideas! The next one is a pet bed by Brian Patrick Flynn. Love it!!! 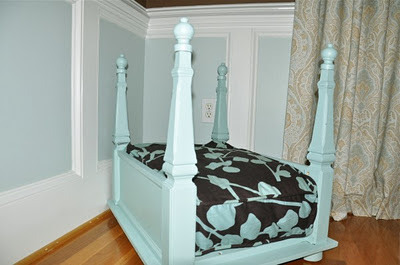 Click on the photo to get instructions for making it on Brian's blog... Houzz. Or how about making a pet bed out of an old side table. So cute and easy to make. The hardest part is finding the old end table, right Debbie? Mary Jean of One Nutty Girl walks us through making the one in the photo below on her blog. I don't have instructions for this cat outhouse, but I know all of you are creative enough to figure out how to make it yourself. I'd just cut an opening in an old side table or night stand, sand and paint. If you don't want to make one, you can always buy one at The Pampered Pet Mart. 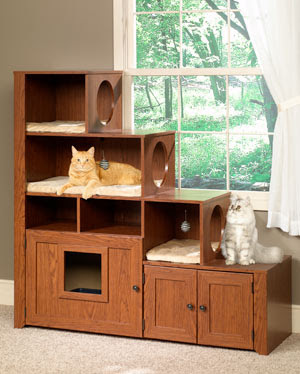 Or you could make an entire cat condo using that media cabinet you no longer use. The one in the picture below is for sale at Cats Play. Whatever you do, I'm sure your dogs will love it. As for your cats... I can't say.